Some 22 years ago, a group of American vintners founded the Meritage Association (Merit+Heritage=Meritage, rhymes with Heritage), aiming to promote American wines blended from the traditional Bordeaux varieties: Cabernet Sauvignon, Merlot, Cabernet Franc, Malbec and Petit Verdot. Estancia was one such founding member. At the time, American wine terms like “Hearty Burgundy”, “Mountain Chablis” and “California Champagne” were under heat from the French and other jurisdictions; “Meritage” would be a legally safe and distinctive way to convey an American “Bordeaux Blend”, which for many US wineries represented a flagship or aspirational wine. 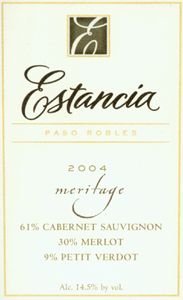 On the 20th anniversary of Estancia’s first Meritage release, as well for the debut of the 2007 vintage, the winery has celebrated with a number Reserve Meritage “verticals” across the country. I was graciously invited to one recently in New York, at Gramercy Tavern , along with some fellow wine writers and bloggers. For the non-geek, “verticals” are tastings of different vintages of a specific wine. These illustrate vintage differences and how the wines change over time. They can be ascending (oldest to youngest) or descending (youngest to oldest). With highly tannic, younger wines in the mix, however, tasting in ascending order is advisable, because the mature wines are softer, more subtle and complex — not as palate-coating as the newer releases. Led by Estancia’s charismatic Director of Winemaking, Scott Kelly, we sampled six vintages of Estancia’s Reserve Meritage, starting with 1994, followed by 1997, two 2001s (I’ll explain), 2004 and 2007, the first release under Kelly’s watch. Prior to 2001, the grapes for the Meritage came solely from properties in the Alexander Valley, just north of Napa Valley. After 2001, the grape source shifted to vineyards developed near Paso Robles, much further south, in the Central Coast region . So, this vertical covered a wine that had changed both vineyard locations and wine-makers (three different ones, including Kelly). The 1994 could have easily been confused with a maturing Bordeaux. Its brickish color showed gentle age, the expressive briar fruit aromas and flavors belied it. Drinking beautifully, it had a fresh minty streak courtesy the relatively high degree of Cabernet Franc in the blend (66% Cabernet Sauvignon, 27% Cab Franc, 7% Merlot), and a slight (but appetizing) barnyard note (possibly a little Brett?). A consensus favorite, it was an enjoyable time-machine ride to a different era in California wine-making. Because 1997 was a hallmark vintage in California, it came as no surprise that the wine had the generous black fruit and mouthfeel the year offered. Soft and juicy with deep, plummy fruit, the wine reflects the flip of the Cab Franc in favor of Merlot (59% Cab Sauv, 30 Merlot, 11 Cab Franc) compared with the 1994. Plenty left in the tank here. In 2001, Estancia hedged is bets, making the Reserve Meritage both in the Alexander Valley and Paso Robles (in case the decision to move south turned out badly! ), resulting in two very different wines. The Alexander Valley had juicy black fruit and minty spice, good length and a tannic grip unexpected for the blend (53% Merlot, 47% Cab Sauv), at 13.5% ABV. From very young vines, the Paso Robles came in a full degree higher in alcohol (14.5), but was balanced and aromatic, sporting deep currant fruit, some tar and herbal notes that signaled the predominance of Cab Sauv in the blend (87% CS, 9% Merlot, 4 Petit Verdot). Obviously, the success of this wine greenlighted a full move to Paso Robles for the Meritage. The 2004 (solely) Paso Robles had notes of licorice and smoky dark fruit in the nose, along with black cherry fruit, bright acidity and some prominent back-end tannins on the palate (61% Cab Sauv, 30% Merlot, 9% Petit Verdot). Still tight and youthful, it will benefit from more time in the cellar. Last, we sampled the 2007, Kelly’s Reserve Meritage debut, in which he upped the Petit Verdot in the blend (which reportedly thrives in Paso Robles) for the new release (61% Cab Sauv, 27% Merlot, 12% Petit Verdot). The result: an opaque, deep crimson wine that is elegant and balanced, featuring nice acidity (despite the renowned heat of the appellation), note of baking spice and plummy, blueberry fruit. Although consistently hot in the growing season, there are huge diurnal temperature swings in Paso (a range as large as 45F to 105F), which help retain acidity and freshness, and promote phenolic ripeness. And the 14.5% ABV is not apparent. Kelly has played his hand well — a great first effort, with plenty of aging potential. To conclude, the vertical showed that the Reserve Meritage wine has evolved through the years. Vintage conditions, blending choices, change of vineyard location and winemakers’ styles all played a role. But there was a unifying factor among all the wines: Estancia’s commitment to the Reserve Meritage’s quality, which the vertical clearly demonstrated. This entry was posted in New York City, Wine and tagged Alexander Valley, Estancia, Meritage wines, Paso Robles, Scott Kelly. Bookmark the permalink.